Looking through friends' bookshelves in South-West France in February 2017 I came across a frail, yellowing exercise book in which was written a comprehensive, knowledgeable and highly-readable A-Z of plants, shrubs and trees of the Bible with biblical references. With it was a packet of line drawings of some of these species on the back of blank postcards whose address side was printed in green ink. The author had declined to put his or her name to the work. I have not seen a concordance like this but have worked diligently through the Bible in the past for apocalyptic and millenarian projects. Flicking around the Internet I discovered there are sites devoted to plants of the Bible and the related phenomenon of Bible gardens. None of these treat the subject in any detail. There is nothing at all published like the MS author's manuscript which, for the second edition of my book, I have reproduced in full. Academic research into the translation of biblical manuscripts along with field work, particularly in Israel is ongoing. The main difficulty in understanding which plant species are being referred to in Bible verses is the unscientific description of the botany followed by inaccurate translation. Looking at work done on the subject of identification since the 1950s I was impressed with how the exercise book manuscript stands its ground even if it is a curious mix of sophisticated comment and simple spelling mistakes. My hosts in France were delighted with the prospect of it becoming a facsimile publication. I found a source of illustrations to supplement the 35 original drawings (from J. H. Balfour's 1885 All the Plants of the Bible), photographed the manuscript (using natural light, a Nikkor 60 mm macro lens and 37 megabyte D810 camera), did the research, expanded the biblical references and updated the taxonomy and botanical nomenclature. It took me seven weeks. 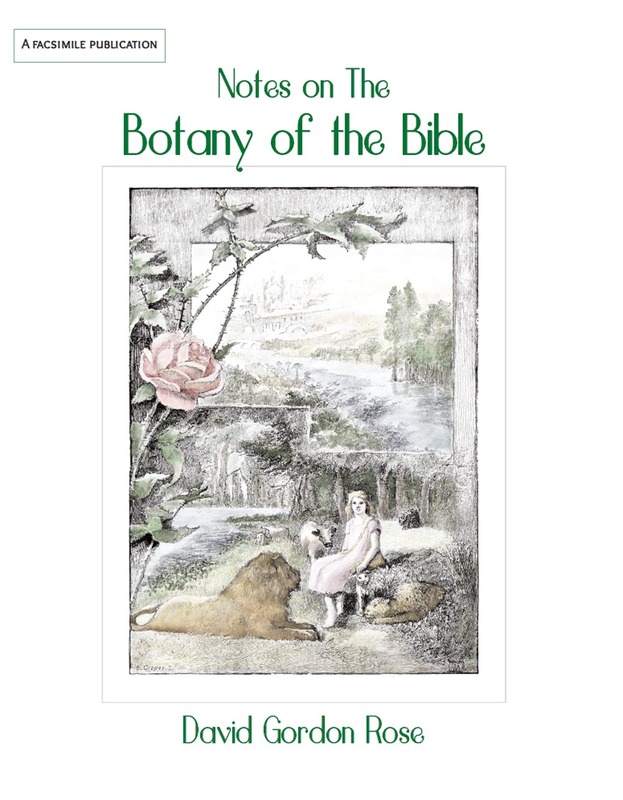 Notes on the Botany of the Bible is now the first book in my (as publisher) Reference series, large format (8 inches x 10 inches or 203 mm wide x 254 mm high.) The second edition (November 2018) is available on-line now. Click here for my publishing site or here for book details or here to see a .pdf sample. A flip-book sample is coming soon. Buy it in paperback and e-book facsimile of the paperback through Amazon. Large format paperback (8"x10"), reference, mono.